Happy Holidays: Continuing the Crazy Card Tradition! Tada! 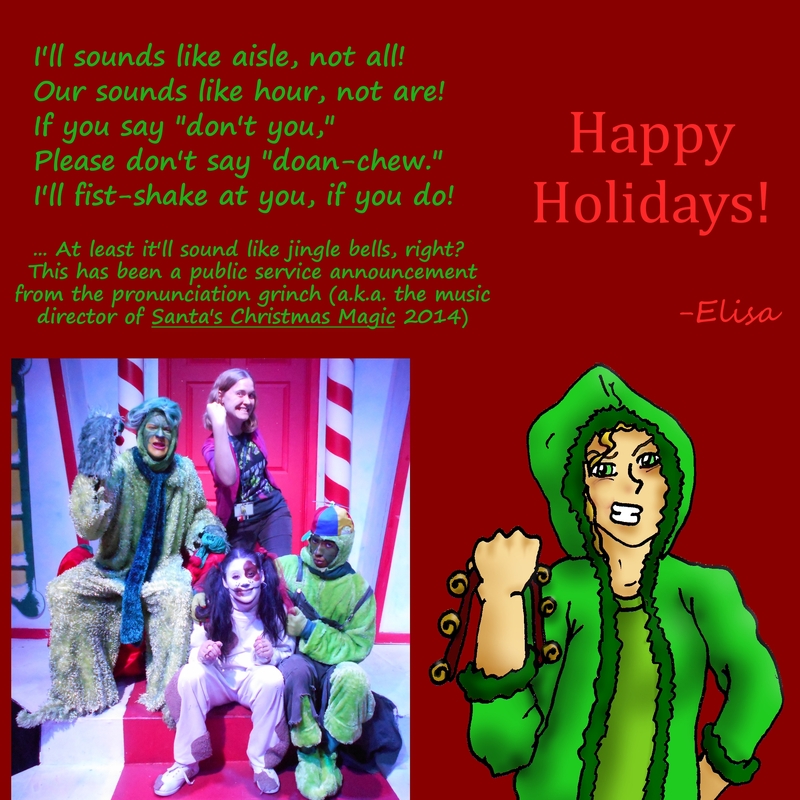 To explain further: one of my major struggles as a music director for Santa’s Christmas Magic was my attempt to help the cast kick their bad pronunciation habits (it’s easy for people to slip into pronunciation laziness in songs they’ve been singing since they could produce sound! ), and my response to repeat offenses was to raise my fist and cry out “FIST SHAKE!” before, once again, pointing out the problem. Yes, I actually verbalized my physical action, and when my students opt to imitate me, that’s the gesture and phrase they almost always choose. As you can see, for the sake of the photo, my students were in on the fist-shake action! Anyhow, I hope everyone has a wonderful, safe holiday season. Incidentally, next up at San Jacinto College Central this theatrical season is Beauty and the Beast Jr. I’ll keep you posted! ← Here Comes Santa’s Christmas Magic!